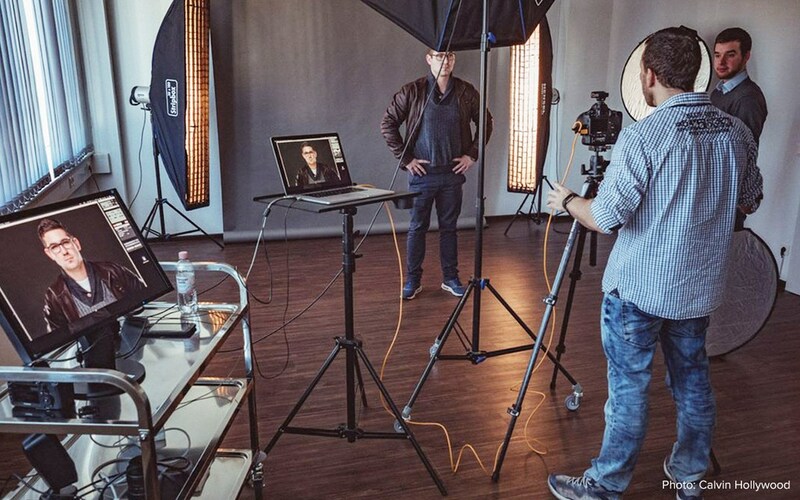 Our useful guide gives you some hints and tips on the benefits of tethered photography - we explore how it can change your studio photography workflow and can help you leave a memorable impression with your clients. Tethering is the process of connecting your camera to your laptop or desktop via a Firewire or USB cable. Files are instantly transferred to your computer from the camera, allowing you to preview the image and save the image file directly onto your computer. 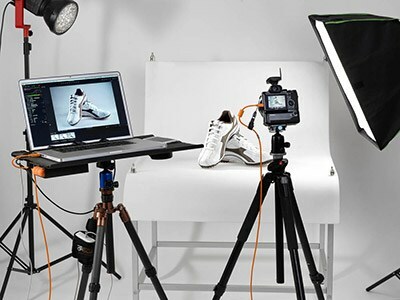 Tethered photography used to be the domain of high-end advertising, fashion and product photographers, but recent years have seen in increase in product range, reliability, and reduction in prices that make it viable for the consumer market as well. If you shoot in a studio environment frequently, it's certainly worth trying. Viewing your images on a large monitor offers significant benefits compared to reviewing images on the LCD screen on your camera – you can make more informed decisions as you can see the image in greater detail. Viewing on a larger screen allows you to view the images closer to print size – ideal if your images will be printed. You can also ensure your monitor is calibrated to maximise your workflow efficiency. Arguably the most tangible benefit of tethering is the ability to review and amend your photos as you are taking them. It can be tricky to see where the focus point is on your camera screen, whereas tethered, one quick click and you can zoom straight in to your models’ eyes. Same principle applies for viewing exposure, highlights, lowlights etc. So one quick shot, a glance at the screen, adjust and move on. There’s no shortage of photographers with a studio out there. So, how to differentiate yourself? Shoots with clients can be deeply involving - it’s easy to get lost in technical details and forget that the shoot is an experience the client is paying for. Tethering is an easy way for you to keep the client engaged – they can review images easily and provide feedback as you go. This can help build rapport and build a memorable experience, setting you apart from other photographers. And any freelance photographer will know – recommendations from word of mouth referrals are incredibly powerful. Shortlist your images as you go, with the option of importing the images into Lightroom (or imaging software of your choice, of course!) as you go. Images can be processed instantly, so clients could have the images before they even leave the shoot. We realise this is a bit idealistic (depending on your workflow), but at the very least images will be saved into folders on your PC – no fussing about, wasting time downloading from your camera / memory card. You can also have all of your images backed up by the time the shoot is finished – reducing pesky admin tasks and letting you move on to the next shoot. How do I set myself up to shoot tethered? Firstly, you’ll want to decide whether you want to connect via USB, or wirelessly. 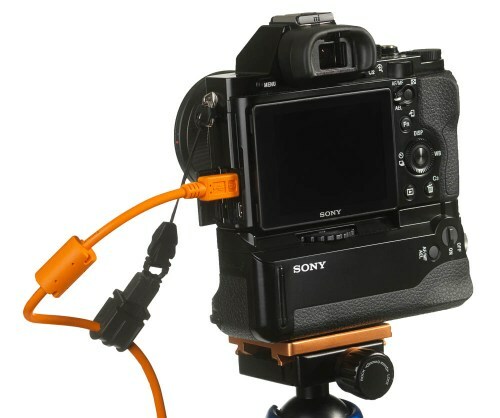 If you’re new to shooting tethered, the USB option is cheaper and a good way to get started. You’ll want to check what type of USB connection your camera has, and get the appropriate cable. See the range of Tether Tools cables that we stock. Our friends at Tether Tools also have a useful guide on their website which clarifies what software you can use – Canon, Leica and Nikon users can all use Lightroom, whereas Sony users can use software such as AstroDSLR. Top Tip – Accessories such as the JerkStopper help prevent the cable from pulling out of the camera – handy during the rigours of a long studio shoot. If you like the concept of shooting tethered, but are not so keen on tripping over the wires, then you can tether wirelessly. The Tether Tools Case Air sits in your camera’s hot shoe, and brings additional functionality on top of transferring files - for instance, you can control time-lapses using your phone. Any questions? Drop us a message in the comments below and we’ll get back to you!